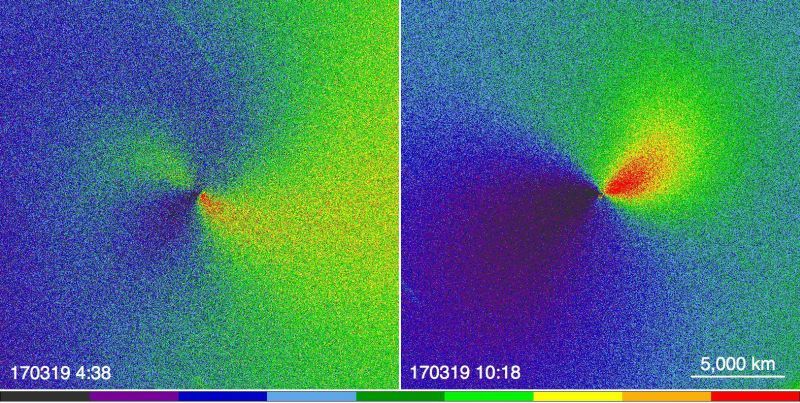 Astronomers from Lowell Observatory, USA, observed the comet 41P / Tuttle-Giacobini-Kresak in the spring of last year and noted that the rotation speed of this comet is rapidly falling. A team of researchers led by David Schleicher (David Schleicher) studied this comet at a time when the comet was at a relatively short distance from our planet. At that time, the period of self rotation of comet 41P increased approximately twice, from 24 to more than 48 hours for six weeks – which was the fastest change in the rotation speed ever observed for a comet. If the rotation of this comet continues to slow down, it can stop and start rotating in the opposite direction. Comet 41P / Tuttle-Giacobini-Kresaka is a short-period comet, which currently makes one revolution around the Sun in 5.4 years. For eight weeks from March to May of this year, this comet was located at a distance of less than 30 million kilometers from Earth. These conditions allowed astronomers to study the comet 41P in detail. When a comet approaches the Sun, gases are released from its surface that form a characteristic “tail” that distinguishes a comet from an asteroid. One of the most common gases of comet tails is the cyanide radical (-CN), and observations of two jets of this gas, conducted by the Schleicher team using the Discovery Channel Telescope telescope of the Lowell Observatory and other ground-based surveillance devices, have established that the comet rotation period has increased from 24 hours in March to 48 hours at the end of April. These results indicate that the comet under study has an elongated shape, a low density of matter, and that the observed jets of gas emanate from the comet surface areas located at its edges, since only in this case the braking moment corresponding to observations is observed, . Compiled from the materials provided by the Lowell Observatory.